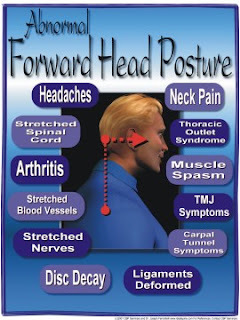 One of the most common postural problems is the forward head posture (FHP). Since we live in a forward facing world, the repetitive use of computers, TV, video games, trauma, and even backpacks have forced the body to adapt to a forward head posture. Repetitive movements in a certain direction will strengthen nerve and muscle pathways to move that way more readily. , An example would be the adaptation of the body to do gymnastics easily after repetitive practice. It is the repetition of forward head movements combined with poor ergonomic postures and/or trauma that causes the body to adapt to a forward head posture. Ideally, the head should sit directly on the neck and shoulders, like a golf ball sits on a tee. The weight of the head is more like a bowling ball than a golf ball, so holding it forward, out of alignment, puts a strain on your neck and upper back muscles. The result can be muscle fatigue and, all too often, an aching neck. Because the neck and shoulders have to carry this weight all day in an isometric contraction, this causes neck muscles to lose blood, get damaged, fatigue, strain, cause pain, burning and fibromyalgia. 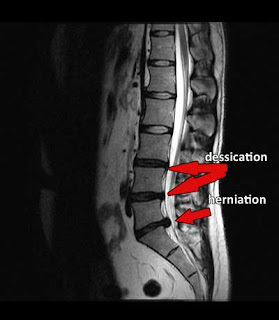 When spinal tissues are subject to a significant load for a sustained period of time, they deform and undergo remodeling changes that could become permanent. This is why it takes time to correct FHP. In addition FHP has been shown to flatten the norman neck curve, resulting ins disc compression, damage, and early arthritis. This abnormal position is also responsible for many tension headaches, often termed cervicogenic headaches. FHP also causes tension in the TMJ (temperomandibular joint) or jaw jaoint, leading to pain, headaches and bite problems. Some evidence exists that postural positions can effect the nerve tissue by altering blood flow to the spinal cord. People with uncorrected FHP can potentially suffer chronic or unpleasant conditions, such as pinched nerves and blood vessels, like thoracic outlet syndrome, muscle and tissue pain, syndromes like fibromyalgia, chronic strains, and early degeneration and arthritis. FHP is relatively easy to detect. Have the person you are checking look up at the ceiling, down at the flow, and then straight ahead. Find the center of the shoulder and draw an imaginary line up. It should land through the middle of the ear’s hole (external auditory meatus). Any forward head posture should be immediately checked by a chiropractor. Medical doctors do not fix these types of problems. “Despite considerable evidence that posture affects physiology and function, the significant influence of posture on health is not addressed by most physicians”. Remember, long standing postural problems like FHP will cause spine and nerve damage, and symptoms are rarely present early on. The first step in correction is to be examined and x-rayed by a chiropractor, to identify the exact measurements of the FHP. Once that is established, a specific corrective care program for FHP is given, including adjustments and specific exercises The chiropractor will point out poor ergonomics and situations that pre[dispose you to FHP and give you practical solutions. For office use and video game play, place your computer monitor height so the top third of the screen is 18”-24” from your face. Support the lower back, and if children sit on the floor looking upward, have them use a floor pillow armchair and sit up straight. Every 20-30 minutes, sit up straight and pull the neck and head back over the shoulders. Hod for a count of 3 and do 15-20 reps. Alternatively, stand against a wall with a small pillow at your mid-back. Move your head back to touch the wall. How for a count of 3, and do 20-25 reps.
always use a back support pillow when sitting or driving. By supporting the low back, the head and neck will move back over the shoulders. At home, lay face down on the floor and extend your head and shoulders up, while pinching your shoulder blades together. Hold for a count of 3 and do 15-20 reps.
Backpacks - maximum backpack weight should be 15% of a child’s weight. Never wear backpacks over one shoulder. Always use a waist belt, and if available, a chest belt to neutralize the load. Without these belts, the head will move forward to compensate for the load. A new type of backpack with an air bladder had been shown to significantly reduce weight without a strap. Monitoring good posture is a lifetime commitment. With a little effort and a chiropractor on your health care team, you can be assured a future doing things you love to do, rather than suffering from damage and degeneration poor posture can bring. Backpacks - Children are now using backpacks to carry school books weighing up to an alarming 30-40 lbs! This forces the head forward to counter balance the weight resulting in abnormal stress to the discs, joints and nerves of the neck, shoulders, and lower back. Computer Ergonomics - Positioning computer screens too low, coupled with the repetitive motion of moving the head forward to read the screen is a primary factor to FHP. Video Games/ TV - Most kids use poor posture when playing video games and watching TV. Repetitively sitting in one position for long periods of time causes the body to adapt to this bad posture. Trauma - Falls and traumas can cause whiplash resulting in muscle imbalance. This pulls the spine out of alignment forcing the head forward. The new Nintendo 3DS hanld-held offers a great 3D gaming experience. But, in order to get the best 3D effect, you have to hold the game system upright in front of your face. I think that's fantastic motivation for kids playing games to maintain their good posture.